You are viewing a snapshot of Episode 679. Full episode here. Singer, rapper, and drummer Anderson .Paak stole the hearts of critics and fans alike with his debut solo album, Malibu, in 2016. But, Greg argues that his half dozen features on Dr. Dre's 2015 album Compton initially put .Paak on the map for many listeners. 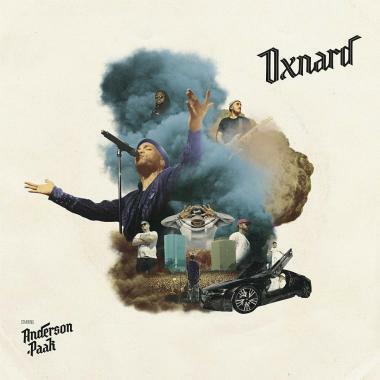 Dr. Dre returns the favor here, producing Oxnard: Anderson's ode to his hometown of Oxnard, California. Both Greg and Jim agree that the production shines here, and Jim is happy that the sound returns to the groovy, old-school roots of West Coast G-Funk. He thinks the album has a "wonderful, sunny vibe"; but, Oxnard is ulimately“a letdown.”According to Jim, tracks like "6 Summers" sum up“everything that's wrong with the record.”He laments that lyrically, .Paak has“nothing to say”and can‘t decide whether he wants to be a“mack daddy”or“woke.”Greg complicates that idea, noting that the conflictedness of the album reflects .Paak’s upbringing: he was raised in church in a community surrounded by a darker street element. They both agree that the record loses steam by the end, and that it's propped up by big-name cameos from rappers like Kendrick Lamar and Q-Tip. Greg adds that .Paak is a better artist than that and should be making records that don't need those kind of crutches."